Are you ready to live free of fear, anger and doubt? You deserve to live free of fear, anger and doubt. Do you find yourself making the same bad choices over and over again? Why do you do that? It’s your past, sometimes called karma, in the form of fears, anger and doubt causing you to make the same bad choices over and over. What if you could live free of that old fear? What if anger and doubt had no control over you? Would you want a life like that? Through a series of yoga and meditation sessions you’ll break the karmic cycle, you’ll break the prison those past fears, anger and doubts have made for you. You’ll free yourself from the karmic seeds that are holding you back in life. You’ll completely deepen and enrich your yoga and meditation practice. And best of all, you’ll start living a life of meditation in motion. Fear, anger and doubt will lose their ability to push you around and you’ll flow with the currents of life without hesitation. Each day has a schedule filled with experiences that you’ll cherish for a lifetime. Our first day together begins at 5pm with a casual dinner at the temple’s buffet. We’ll fill the next two days with yoga twice a day and multiple guided meditation sessions. We’ll blend time on the mat with open discussions that turn what you experience each session into something you can take home with you. On the last day, we’ll experience two highly personalized yoga sessions together and reflect on how much life has changed in just this one weekend. The entire retreat takes places at the beautiful Sri Sri Radha Krishna Lotus Temple. 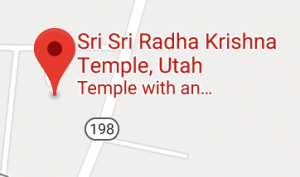 The majestic Rocky Mountains of Utah surround this exquisite temple. It sits on a hill, nestled among the farmlands of Spanish Fork, Utah. Peacocks, lamas, parrots and koi along with multiple vegetable gardens grace its grounds and pond. Local participants typically stay at home and commute, often carpooling, to and from the retreat each day. Traveling to Utah? Very limited accommodations are available at Bhakti House for $25 per night. Call 801-251-6242 for availability. We also suggest using AirBnB to find an affordable room to rent for the weekend. You might also be able to find a room with another participant or even stay with one of our local participants! We have a travel group on Facebook to help you make these arrangements. You can find it here. We will contact you as soon as possible to complete your registration.